CAMBRIDGE, Mass., Jan. 24, 2019 /PRNewswire/ -- The success of firms is now in great part determined by their ability to exploit technology to its highest potential. This reality is bringing about a very different future for the IT organization where technology-driven innovation will be a core competency --- and the boundaries between IT and the business will fade. A number of forces — from customers to executive leadership — are combining to compel IT to take a larger role in the business and ensure that technology creates new capabilities that shape and guide a firm's strategy and operations. 1. Boards and CEOs will look beyond financials to value IT: Stakeholders will become fluent about technology choices and how to use business technology for strategic advantage. 2. Budget allocations will go to real-time: More organizations will shift away from annual budget cycles, embracing a more flexible funding model for easy reallocation of budget, human capital, and tech-driven innovation. 3. Shadow IT will evaporate: Business leaders will move into an immersive partnership with IT, creating teams with members who bring IT technology skills and business instincts on capitalizing on existing and emerging technologies. 4. CIO personas will multiply: The changing role of the CIO will move from a support function to a central figure in what the company does, moving from caretaker to disruptor and technocrat to business visionary. 5. Tech skills gaps will shrink: IT roles will no longer be built on specific expertise and hierarchies but will be dynamic to the task at hand and expected to pull capacity and competency from a broader range of sources. 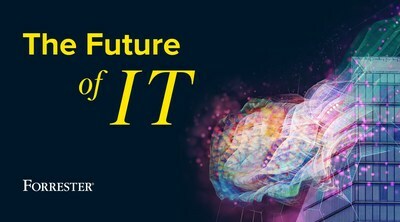 Download Forrester'scomplimentary guide to learn how to prepare for the future of IT.